Only 1% of dementia cases can be cured with treatment. These types of dementia usually evolve as a side affect from conditions such as an operable brain tumor, vitamin B12 deficiency, thyroid disease, hydrocephalus, alcoholism or depression. All other types of dementia are rarely reversible. Vascular dementia, which occurs in about 10% to 20% of cases, often results from a series of small strokes that destroy brain cells or from deposits of amyloid protein on blood vessels which cause them to rupture. Symptoms may include paralysis on one side, incontinence, and a mask like expression. This type of dementia is usually brought about by chronic high blood pressure, diabetes or coronary heart disease. Lewy Body dementia accounts for 5% to 15% of cases and is caused by deposits of alpha-synuclein protein throughout the brain. Those with this type of dementia have memory loss symptoms the same as Alzheimer’s in addition to motor problems similar to Parkinson’s disease. With Alzheimer’s disease, the most common type at 60% to 80% of the cases, the damage to the brain is more severe and ultimately affects larger regions. In the Alzheimer diseased brain, nerve cells (neurons) stop functioning, lose connections with each other and ultimately die. The death of many neurons in key parts of the brain causes those areas to atrophy and shrink. The strongest theory for the cause of Alzheimer’s disease is based on the presence of amyloid plaques and neurofibrillary tangles in the brain of patients. Researchers still can’t say, though, whether they are a cause or byproduct of the disease. 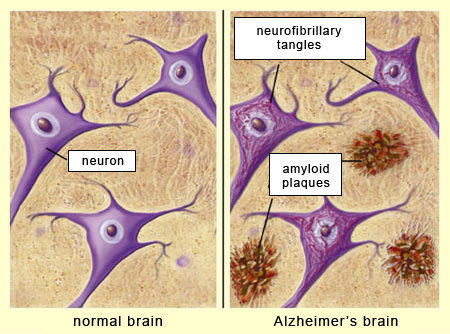 Amyloid plaques are a mixture of of abnormal proteins and nerve cell fragments that develop in the tissue between nerve cells., They are formed when the amyloid precursor protein which is part of the nerve cell membrane is broken down by enzymes when a nerve dies. One of the enzymes, beta-secretase, cuts the protein into a piece, the plaque, which is insoluble. This piece is toxic and eventually causes other nerve cells to die. Neurofibrillary tangles are formed when a protein called tau becomes twisted. Tau plays an important part in the internal support structure of microtubules. In healthy neurons, microtubules act like railroad tracks carrying nutrients from cell to cell. When tau becomes twisted, it disturbs the function of the microtubules which, in turn, affects the communication within the nerve cells and leads to their death. Another discovery characteristic to Alzheimer’s disease is the reduction of cholinergic neurons in the brain. These neurons, prolific in the hippocampus and cerebral cortex, produce acetylcholine, a neurotransmitter critical to memory and learning. As the disease progresses, acetylcholine levels drop dramatically and the dementia worsens. Levels of other neurotransmitters such as serotonin, norepinephrine also drop which have a direct affect on patient behavior. It is thought the reduction is due to brain cell death. This entry was posted in Uncategorized and tagged Aging parents, alzheimer's, Dementia, Memory loss, mental-health on February 27, 2018 by kathybjork.